Gregory Büttner and Rhodri Davies met in Hamburg in April 2006 and decided to collaborate. The basis of this recording is a ten minute harp improvisation by Davies. On his return to London, Davies sent his piece to Büttner, who digitally processed and edited it to three different tracks. lt was Derek Bailey and Han Bennink who defied the cardinal real-time, real-presence rule of Improv by posting one another cassettes of solo performances and then overdubbing them. They then compounded the horror by calling one of the eventual releases Air Mail Special, as if it was a set of old swing covers. 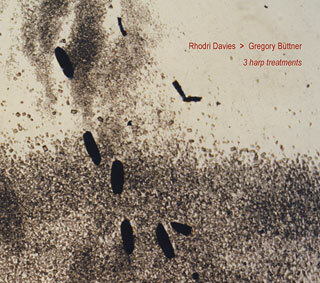 The most remarkable aspect of Rhodri Davies's collaboration with sound artist Gregory Büttner is that it never for a moment sounds like a sequence of ex post facto treatments, but alive, fresh and endlessly responsive. Büttner is still perhaps best known for his Für Diesen Abend duo with Stefan Funck and their extended work with Overheadprojections artist Katrin Bethge, who provides the visuals here as well. For this project, Büttner digitally processes and edits three new works out of a single ten minute harp improvisation by Davies. The first piece, "Glas", alternates gamelan-like effects and waterphone sounds with periods of shimmering near-silence. As the title suggests, "Plok" finds tiny, percussive effects in the source material. One has a sense of hearing faint decays, delivered without the original attack (whatever form it took), rigidly gated to produce a spare, uncompromisingly spacious performance that is far more dramatically busy than its actual sound would suggest was possible. "Bow" opens on a tense, unsteady drone and moves with eerie slowness for more than a quarter of an hour. At just over 40 minutes in total, there might have been room to include Davies's original improvisation. But since this is a collaboration, and a highly unified one at that, the inclusion might have created a false impression of track-plus-mixes rather than, as they should be considered, three original and free-standing works. Quaint and endearingly fusty like a wind-up gramophone is how the sentiments expressed in the commercial of three decades ago, which asked listeners whether the performance they were hearing was live or on tape, now seem in the 21st Century. Today all sorts of electronic fill-ins and additions have been accepted as part of everyday musical life with many a pop diva lip-synching entire performances. On the CD, Davies’ 10-minute harp improv is renovated into tracks that run from a little more than 10 minutes, to almost 13 and almost 17. Büttner uses differing chunks of the original for granulation and re-conceptualization. “Glas”  the briefest  for example, is centred on a sonic Catherine’s wheel of superimposed blurred textures and shrilling static that suggests empty tape reels flopping as it completes its circular rounds. Straightforwardly percussive, “plok” matches what could be metal being gored by an unyielding object with marbles reverberating off taut strings as well as spinning impulses that sound like cymbal strokes and bass drum pounding. Eventually the individual pick-up signals are squashed into tunnel-echoing whirrs and a climax of repeated string strokes and smacks. Lengthened to the greatest extent, “bow” builds up to a crescendo of nearly opaque textures as backwards-and-forward running vibrations expose intense, agitated sound fields. The track begins with a flat-line murmur that eerily foreshadows the final results, then synthesizes and reconfigures pitch-shifted and grainy wave forms so that the resulting dense tessitura becomes almost overbearing. Luckily wooden-sounding ratchets and leaking hisses puncture the distended sound envelope so that the results fade diminuendo. Using exceptional source material or showcasing cerebral improvisers who know how to manipulate electronics makes the question of live verses pre-recorded creations moot on these sessions. Individual virtues of these CDs are as much as the result of invention as the equipment used. Renowned Welsh-born improvisor and experimental harpist Rhodri Davies joins forces with Hamburg-based electronic musician Gregory Buttner for this venture, finding new, abstracted ways of presenting and transforming the natural timbral range of the harp. Far from being a conventional instrumentalist, Davies' body of work reveals an artist with a keen ear for breaking down conventional notions of performance, and so this was never going to be one of those interactive electroacoustic records in which a straight solo recital gets sliced and diced by a laptop for the mere sake of it. Instead, these two artists have a synergetic approach to their craft, with both acoustic and digital aspects searching out the path least travelled. On 'Glas' we're struck by a flurry of metallic textures of various shapes and sizes, starting with a hailstorm of nuts and bolts early on only to flirt with deeper, more resonant tones. Sounding less mechanical, 'Plok' deals in more diffuse noises, from sporadically percussive, high frequency jangles to industrial clanks. Different again, 'Bow' opts for slow, sustaining drones as its central concern, its title possibly alluding to the use of an Ebow in eliciting these continuous strips of tone from the harp's strings. Three strong pieces with three distinct identities, these electroacoustic improvisations demand your fullest attention but reward amply in return.